60 North maybe, but the corners of the Gulf of Boothia and the Foxe Basin tend to have some pretty tenacious floes. 70 North, it's possible, but add the McClintock channel to the problem spots. 80 North seems unlikely, too much ice is going to be spit out into the Fram Strait, and the ice up against the Canadian arctic is too darn thick. Oops, make that 70, 75 and 80. I need to learn to read a map. How much area is there between 80 and 90N (land + sea)? I think minimum sea ice area could be below that. Neven, 3.88 million sq km. CT area is well below that. But whenever extent falls below that number, it will be something of a milestone. 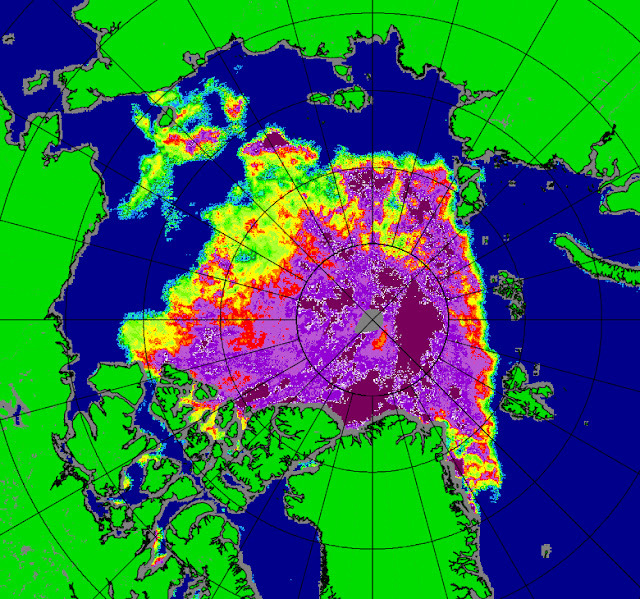 Look at the area of multi-year ice from the Canadian Archipelago eastward past Greenland. Look at the area of ice free coastal waters from the Canadian Archipelago westward past the midst of Russia. The waning ice is allowing the Arctic Ocean to cool off. Eunice thinks this will lead to more sea ice fairly soon. Deinst is essentially correct. The last sea ice in the Arctic will be found piled up against the north Greenland and Canadian Archipelago coasts, between 80 and 85N, after everything poleward of 85N has melted out. I'd expect a fair amount of sea-ice to survive between 75N and 80N, next to the Canadian Archipelago, even while the melt takes a substantial chunk out of the central Arctic 90 degrees to the West.